The building, known to the villagers as the Society of Anba Karass, had been for ten years used as a community centre. Four years ago, it was granted official permit for use to practise religious rites. Sohag Diocese also filed an application in September 2017 with the Cabinet-affiliated committee for legalising churches to have Anba Karass’s gain legal status as a church. The building serves some 1300 Copts; the closest church being 20km away, no walking distance for the old, sick, or children. It is a small building, its area a mere 100sq.m, so Sohag diocese purchased a small house adjacent to the church and connected the two buildings. It also started constructing three more stories above Anba Karass’s. Two stories were built some two months ago; the third was already being constructed when, on Thursday 11 April, the Omda (Mayor) of Naja Khalafallah discovered it. He resentfully and belligerently drew the attention of the Muslim villagers to the expansion works at the ‘church’, and reported the matter to the local government which then sent a squad that confiscated the building material the church had purchased for use in the construction work. The Omda’s belligerence did not stop at that. 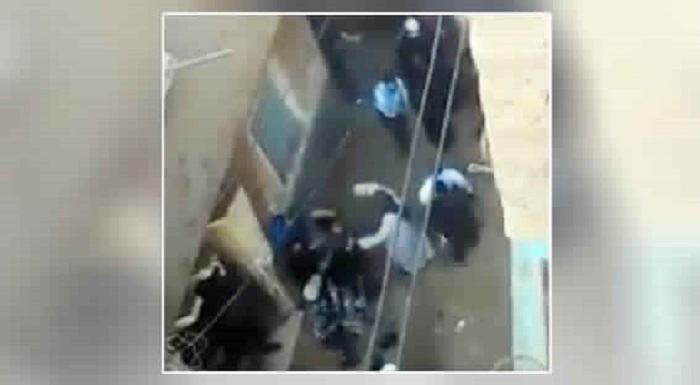 He incited the wrath of the Muslim villagers against the Copts and when, on Friday 12 April, an angry crowd of them gathered, he egged them to protest the enlargement of the building. The Muslim mob headed to Anba Karass’s around 4pm, a time when Coptic children were at the church for Sunday School. The mobbing crowd, which was armed with sticks and knives, could not reach the church since it is located in a street which has an iron gate at its entrance. They could not get through the gate, but their presence and shouts terrified the children. The police arrived, dispersed the demonstrators, guided the children safely out, and escorted the two priests, Fr Bakhoum and Fr Athanasius, out of the village. A demonstrator made an unsuccessful attempt to hit Fr Athanasius and a Coptic man, Assad Bekheit Rizqallah, with a stick but the priest and Mr Rizqallah escaped with very slight injuries. None of the perpetrators or demonstrators was caught. In the evening, the police questioned Fr Bakhoum on the details of the incident, and informed him the Anba Karass building would be closed in the interest of averting possible violence. Fr Bakhoum said he attempted to explain that the closure would severely pain the Coptic congregation who would, in a week’s time, observe Palm Sunday, Passion Week, and the feast of the Resurrection. His point was overruled, however, and the building was closed down. Anba Karass’s is not the first church to be closed for security reasons on account of Muslim mobbing against it. Among the many churches in Egypt closed in the same way are churches in the villages of al-Hager and al-Naghameesh in Sohag; Ezbet Sultan, al-Zaafarana, and Koum al-Raheb in Minya; and Kafr al-Wassleen and al-Qababat in Etfeeh.